Design consultancies have touted their multidisciplinary teams for decades, but the rise of startups-as-a-service have brought the discipline mash-up to a whole new level. I learned about this first-hand while working at BCG Digital Ventures, a venture consultancy that pioneered the structure of a new platform—one with equal rigor in design, strategy and tech—allowing it to rapidly launch new businesses with influential corporations. While multidisciplinary collaboration speeds up time to market, it’s very different in practice than it is in theory. Each discipline embodies a different set of unseen but integral values. Mixing them together and expecting it to just work without considering how to accommodate their inherent differences is magical thinking. Imagine the various disciplines as different species of fish—although a few of these species can live in both freshwater and saltwater, the vast majority have evolved to require a specific environment to survive. In this same way, we couldn’t expect an engineer’s working style to be exactly the same as a designer’s, and vice versa. Early on, I discovered the need to quickly develop new tools and codify best practices into scalable methodology. Postmortems of venture work revealed that team members often assumed their way of working, values and KPIs were the norm. For example, on one early venture, someone upstream promised a clickable prototype as part of the final product. The design team had a much more robust definition of a clickable prototype, however, and didn’t think they could execute this well, causing friction within the team. Without a shared vocabulary helping teammates see eye to eye, expectations proved hard to change. Empathy, the ability to understand and share the feelings of another, was integral in developing this vocabulary. Being empathetic can help teams become more collaborative, agile and innovative. These workshops first began as best practices for ethnographic interviews that were then applied to scoping and project process discussions. They continued to expand as I led strategic design for the incubation of Takt, a real-time personalization platform that empowers brands to build nuanced relationships with their customers. The head of this venture encouraged me to find ways to help the platform be more humanistic. Dissecting how we relate to each other organically could help transform a coupon into a moment of meaningful human connection. Around the same time, I was also taking calls from people in crisis at a suicide hotline. I saw how empathetically responding to people’s needs was, in essence, the same thing that Takt was trying to do for their customers through new technology. The empathy workshops were born through this intense focus on empathy, which enhanced the interactions I had with my colleagues. Being empathetic is a skill, not a trait. We must exercise it like any other muscle. From an evolutionary standpoint, collaboration within familiar groups helps us compete. But with less familiar “outgroups” that each embody a unique value set, empathy breaks down, as seen with different disciplines in business. From a neurological standpoint, mirror neurons help us feel what someone else is feeling (also known as affective empathy). For example, if you see someone get punched in the stomach, your hand might naturally rise to protect that area. Cognitive empathy, the ability to cerebrally understand what someone else is feeling, is more detached and occurs via other pathways in the brain. Unless your brain is different than the ‘norm,’ your neurological empathy machinery is naturally running, but not always at full steam. To this end, I developed workshops that taught people the tools they need to jump-start their own internal empathy machine. When we talk about empathy exercises, we first think about how to amplify. Many need help seeing beyond themselves and their assumed norms. In this case, we focus on exercises that teach active listening, building rapport, cultivating a compassionate mindset and tuning into one’s own empathic responses. My teammates on the business side were typically not used to swimming so deeply in these waters. Their logic and metrics-based value system dominates the commercial sector. Those within the more creative disciplines were often too empathetic and could be overwhelmed and distracted by other’s needs. Designers often need to tamp down their empathy for others and follow their own voice.For them, the workshops were tailored to setting boundaries, encouraging others to see their perspective and filtering out noise that can block out the creative processes. The goal of the empathy workshops was to balance the scales of empathy. Like Goldilocks, we were looking to find the middle ground that is “just right” for team members from all disciplines. After covering these basic components, teammates would role-play to practice interacting in a safe environment. These were tailored to the specific venture, client, or problem team dynamics. I found that players often learned just as much being the receiver of empathetic (and not-so-empathetic) responses as they do being the giver. The purpose of the exercises was to help build the emotional vocabulary for future interactions. 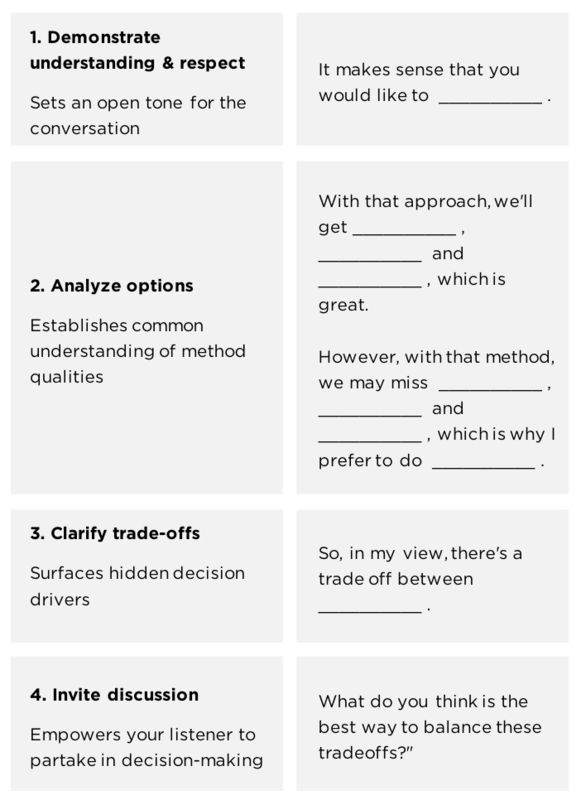 With so many ways of working across disciplines, it was easy for my teammates to get tripped up in arguments about what to do next. Being empathetic to differing perspectives sped up the process of aligning on the best approach. “Feel in the Blanks,” is a simple recipe that I developed to do this in four parts. I often heard participants remark that they would like their partners and family members to attend these workshops. Indeed, the skills we practiced could also be applied outside the walls of the ventures. Since implementing the empathy workshops, I saw more intimate ethnographic interviews inspire better products. I also saw more meaningful applications of new technologies, such as the more responsible use of AI and personalization, which helped new products avoid being creepy, invasive and annoying. I believe that empathy is the unsung hero of strong collaborations, which ultimately lays the groundwork for more meaningful innovation.